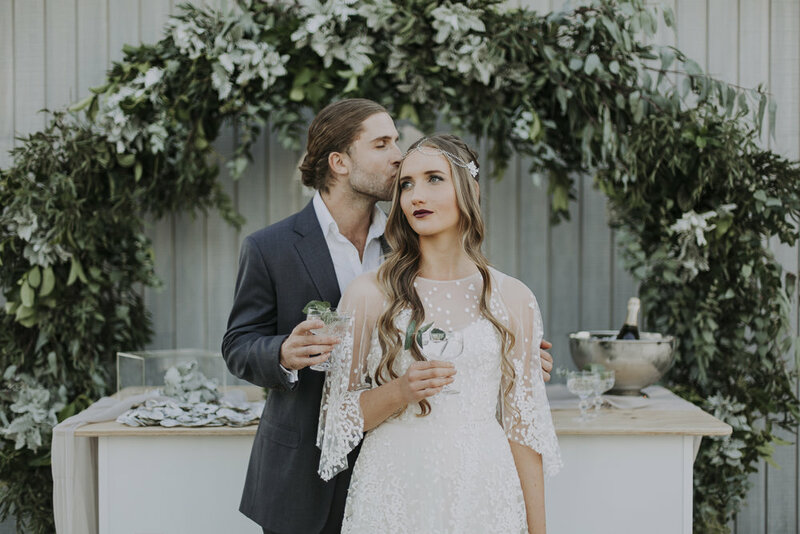 "Whether you’re planning your wedding yourself or want us to plan it for you, this seasonal trend “How to guide” will share the best insider tips on how to style your wedding. You will also be inspired to stay in trend with every aspect of your life regarding fashion and design in your home. We will also share insider tips to help you plan your wedding day." To frame the beautiful backdrop is a gorgeous arch full of greenery. The circular structure is the perfect arch as it brings a softness to the overall look while still being bold enough to be a feature on its own. An oversized tablecloth flowing down the ends of table creates a beautiful relaxed yet sophisticated aesthetic. Grey dinnerware and napkins are complimented by clear perspex menus which adds a subtle yet effective touch of simplicity, and the two-toned cutlery paired beautifully to create the final look. Clear perspex boxes filled with gorgeous greenery created the centrepiece are the hero pieces on the table, adding depth and texture to the overall styling. As we are welcoming in the cooler months, the vibe of this shoot reflects the chilly winter days that are on their way. Combining a number of different components into our styling, like flowing chiffon and grey toned dinnerware, we created a gorgeous relaxed winter atmosphere. Barefoot sandals were the perfect addition to add to the relaxed vibe as the soft sand could be felt underfoot. Throughout the styling, soft tones are used to compliment the winter atmosphere, with grey being the feature colour within the palette. Varying the different shades of grey slightly adds interest and depth to the overall look, and allows the simplicity of the colour to shine through. White components such as the table cloth and bentwood chairs creates a beautiful and soft contrast. 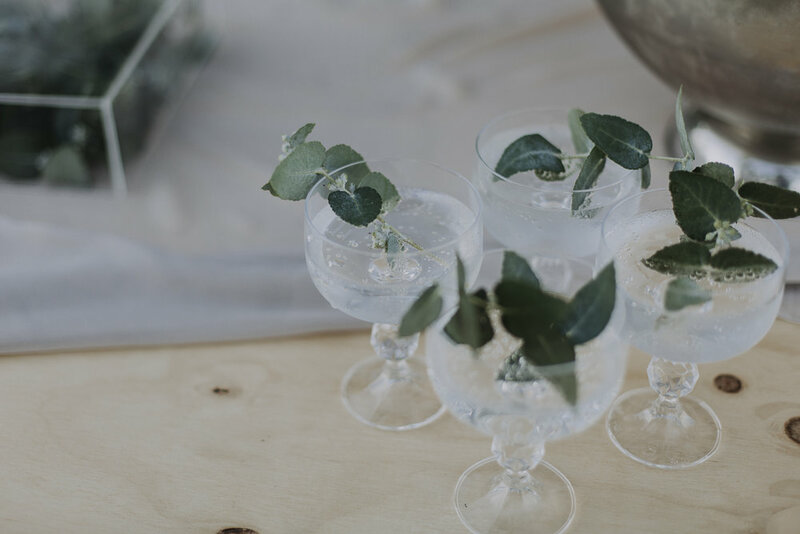 Touches of greenery are seamlessly incorporated, resulting in a relaxed style and creating the perfect grey colour palette for a winter wedding by the water. 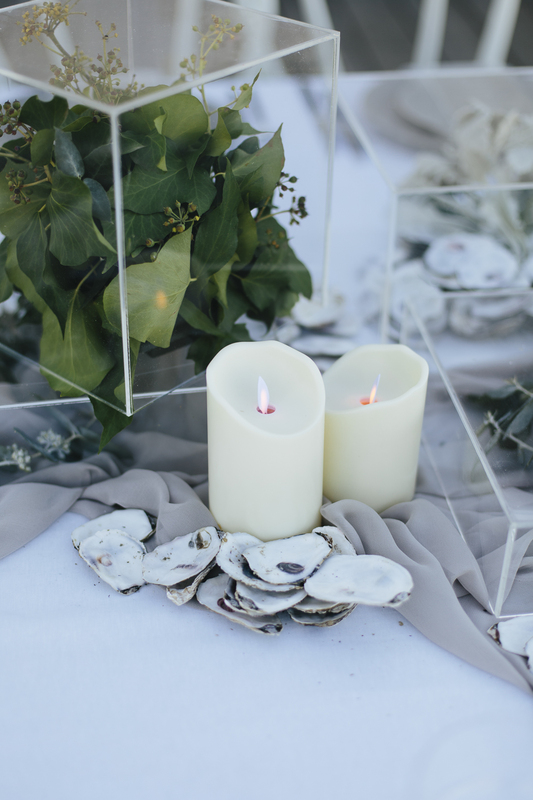 You can use this style for any venues by the water, venues that are neutral in colour or anywhere where you have a ‘blank canvass’ to work with. This concept focuses on creating a relaxed winter vibe and can be used in any application to achieve that same feeling. This simple and soft toned aesthetic is super versatile and is the perfect style to build upon by introducing any other colours you may wish to include. For more ideas on how to style your wedding, follow Foreva Events through the seasons. Watch the video from the day!